…hits the streets of West Norwood this Sunday 4th October! What with it being autumn and all of us getting the harvest in, we are asking that you Feast punters turn out your cupboards and bring what you can to Feast. The Norwood FoodBank will have its very own stall at the Food Fair and will be collecting donations for local families in need, here’s just some of what they’re after. Note: NO PASTA or TEA. No one likes pasta with tea, really. 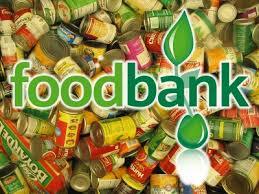 Winter coats, hats, gloves, scarves are also wanted – if your cupboards are bare but your wardrobes bursting. The choirs of both Chatsworth Baptist and St Luke’s churches will be joining forces at 12.30 to sing in the harvest festival on the steps of St Luke’s and then up to the Family hub at the leisure centre.There will be FoodBank donations points at both Feast hubs (so no excuses). If you can’t memorise it, never fear, we will be handing out these at Feast. 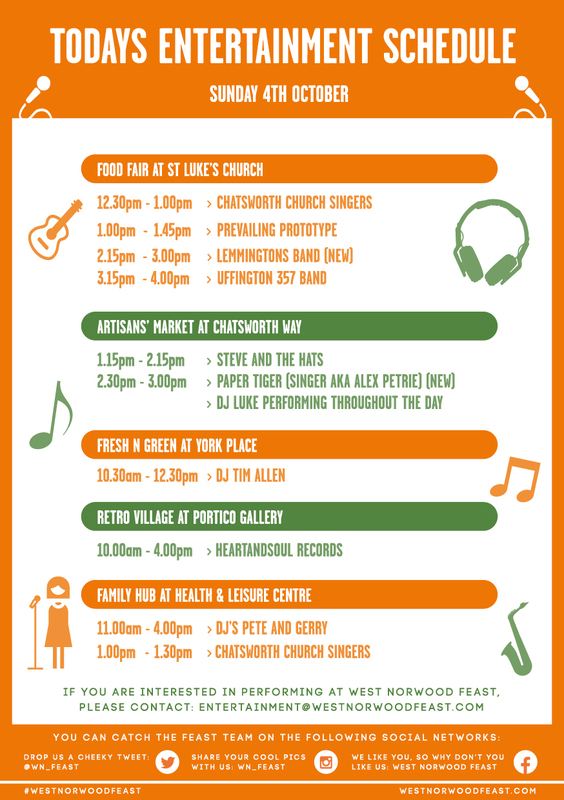 There’s the usual faces (some with hats) and new local talent too – Alex Petrie (AKA Paper Tiger) playing at Artisans and The Lemmingtonsperforming at St Luke’s. And as it’s Black History month, the team from South Lambeth Play Partners up at Family hub tell us they will be making African style jewellery with pasta, beans and bright paint. Take the nippers up there and they can eat a £2.50 Beamish & McGlue lunchbag while they get artistic. 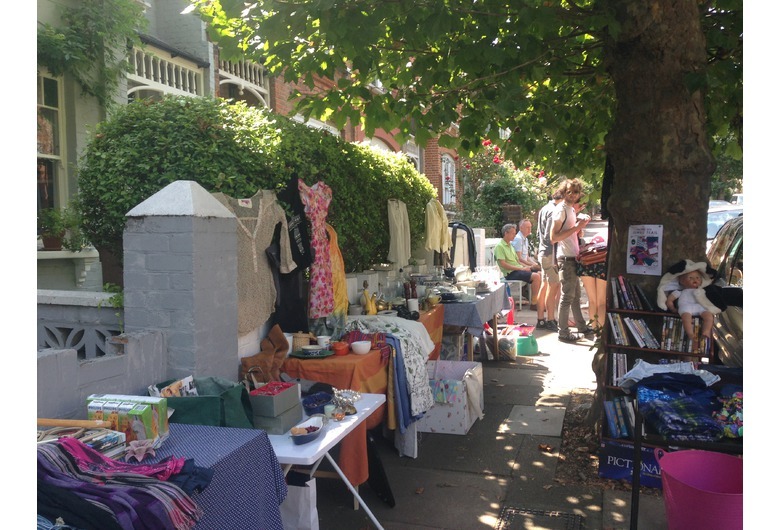 It’s not just Feast this Sunday, West Norwood will be hosting its third Jumbletrail (99 households participating at time of writing) so you can peruse your neighbours’ fine offerings on your way down to Feast. It’s also Lambeth Open this weekend, check out their website, it has Feast stalwart and amazingly talented wonderful human being Martin Grover as its featured artist – whose work you can see at the Portico Gallery, along with a whole host of other local artists. Remember too that Retro is at the Portico again this month, so 23A Knights Hill is yet another destination this weekend, Feast goers. …followed two weeks later by Downtown 81, billed as “a rare real-life snap­shot of ultra-hip sub­cul­ture of post-punk era Manhattan”. Bit like West Norwood, really.